A Gurn from Nurn: "The Path to Cawdor" and the road to rehabilitation for Macbeth? "The Path to Cawdor" and the road to rehabilitation for Macbeth? Firhall resident Brian Lockey has combined his love of photography with his interest in history to write a book about the much maligned former king of Scotland who has endured centuries of bad press due to the spin that Shakespeare put on the monarch’s life. Brian hopes that " readers will learn enough about the real Macbeth to appreciate that his reputation, and that of his wife, have been done irreparable harm by Shakespeare." were alive today he would be a Westminster spin doctor? The industry that as grown up around depicting Macbeth as a blood-thirsty monster continues and shows no signs of abating. According to a review of a new film version of Macbeth, it seems there might even be more impetus to darken his reputation: "As a result, Marion Cotillard’s Lady Macbeth is both more sympathetic and more sidelined than one might expect, no longer the driving force behind the bloody deeds, more a damaged partner in crime." More here. Brian diligently examines the Shakespeare version of Macbeth and then looks into other legends and crumbs of knowledge that we know including the Monarch’s birth in the Moray area– maybe it might even have been closer to Nairn than some think? There are so many gaps in the Macbeth story it leaves us all the chance to fill them in for ourselves and imagine a different time in Nairnshire and even Macbeth going about his business, journeying through this area – maybe he was almost a Nairn resident at one time? Brian looks at the local connections to Macbeth, the Scottish dimension and beyond; his writing is coupled with quality photographs that catch more than passing attention to add to the informative and pleasurable read. For Brian his book began with a haunting image he took on the footpath to Cawdor that lies just across from Firhall, it inspired him to start writing. 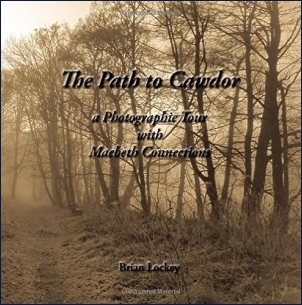 It’ll be hard for Macbeth to ever take his true independent place in history given the inventions of Shakespeare that hid the true life but every step on “The Path to Cawdor” will assist that goal. Brian's book is available on Amazon here.